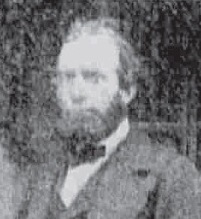 Richard Bentley was born in England in 1820. He came from England to Nauvoo in 1843 and then crossed the plains from Council Bluffs Iowa to Salt Lake City in the early 1850s. From there he went to Carson City which at that time was part of the Utah Territory. Returning to Utah, he lived in Nephi during the Indian troubles. He went on a mission to England in 1860, returning to Salt Lake City on November 3, 1864. "Since I had no job here, I was glad to go, as I could set myself up in the mercantile business in the City of St. George. Elder Orson Pratt, who had been released from the Dixie Mission, was glad to trade his newly erected adobe home to me for my adobe one in Salt Lake City. In a short time, I was on my way with my family and merchandise to set myself up as a pioneer merchant, and with prospects of a new home awaiting our arrival. My eldest son, Oscar, was a lad of fourteen so he could easily manage one of the outfits. Upon our arrival we found a commodious two-story house, located across from the store and office, and I found that I was the first merchant in the city of St. George. I continued in this business until 1875, when my son-in-law, Edwin G. Woolley, with two associates, set up the Woolley, Lund and Judd Mercantile Institution. They bought me out, giving me credit on their store for value received." After the death of Elizabeth, Richard married Hannah Cox Welch. Upon arriving in St. George, he opened a general store. For many years, he was the only merchant in St. George, retiring from business in 1878. Bentley served as mayor of St. George from April of 1877 to 1882 and again from 1888 to April 12, 1990. He died in March 24, 1906 at his home in St. George. He left a wife, 6 children, 40 grandchildren, and 10 great grandchildren.